At Dental Choice, Halloween and treats can come hand in hand… just not the way you traditionally expect. 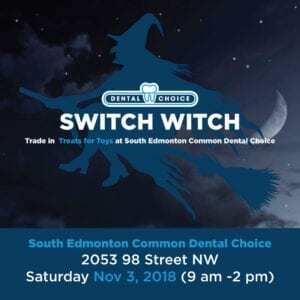 On Saturday November 3rd (after your tots have indulged in a few treats or two), come into South Edmonton Common’s Dental Choice and trade in treats for toys! Bring in your Halloween candy, and for every pound Dental Choice gives you a token to shop around and pick from small, medium, and large toys! What happens with the candy? The candy collected will get sent overseas to the Canadian Armed Forces. An art station will be set up for kids to write notes and draw pictures for the Troops.